While it may not seem a purely spiritual practice, I've made a habit of re-reading Dostoevsky's The Brothers Karamazov every summer for the past 15 years. Early on, I wasn't sure why this novel held so much power for me; I only knew that it did. It wasn't until I got some four years into my habit that I finally noticed how powerfully Saint Isaak of Syria (seventh century) figures in Dostoevsky's work. The author kept a copy of Saint Isaak's Ascetical Homilies readily at hand, poring over its pages throughout his life. 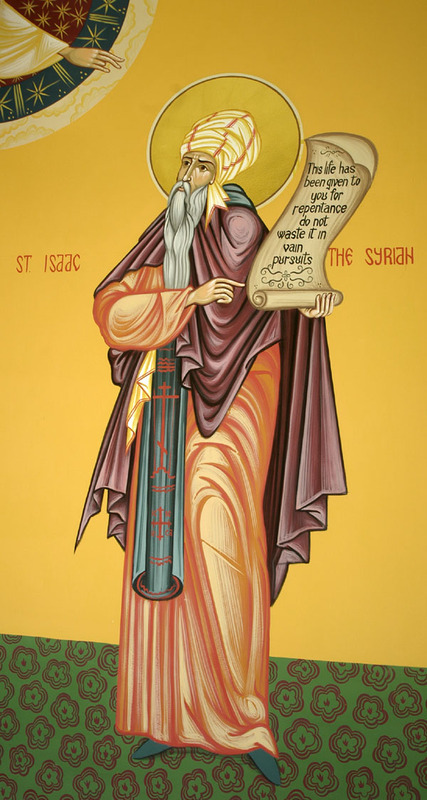 As it happens, many years ago, as I was making my own slow way toward the Eastern Orthodox Church, Saint Isaak's Homilies helped tug my heart home. "[Both] the Kingdom and Gehenna are matters belonging to mercy. ... That we should say or think that the matter [of Gehenna] is not full of love and mingled with compassion would be an opinion full of blasphemy and insult to our Lord God. ... Among all His actions there is none which is not entirely a matter of mercy, love, and compassion: this constitutes the beginning and the end of His dealings with us." All of the God's actions, the saint insists, have to do with our recovery, our healing, our becoming whole. None is unrelated to the overarching mercy, love, and compassion He bears for us. The psalmist says, "The Lord has chastened me sorely, but he has not given me over to death." The Psalmist says, "He will not maintain His anger, nor will He forever keep His wrath." Such figures as "His anger" and "His wrath" finally come to be seen as provisional metaphors, garments He will one day discard. So He removes our transgressions from us." For Isaak, then -- and now also for me -- all suffering is understood to be remedial; it is understood as a means to our recovery -- and no end in itself. In The Brothers Karamazov, Saint Isaak is mentioned by name several times, and his Ascetical Homilies acknowledged twice. While both old Grigory and odd Smerdyakov are shown to have held these homilies in hand, it is the Elder Zosimas who carries Saint Isaak's words written upon his heart; Elder Zosimas is the one who receives the saint's words, incorporates them into his own speech, and -- more to our point of the moment -- he is the one who has found a way to embody them, to perform them. "[Zosimas] stepped towards Dmitri Fyodorovich and, having come close to him, knelt before him. Alyosha thought for a moment that he had fallen from weakness, but it was something else. Kneeling in front of Dmitri Fyodorovich, the elder bowed down at his feet with a full, distinct, conscious bow, and even touched the floor with his forehead. Alyosha was so amazed that he failed to support him as he got to his feet. A weak smile barely glimmered on his lips. 'Forgive me! Forgive me, all of you!' he said, bowing on all sides to his guests." Thereafter, preparing to die, the elder counsels his brothers. "Love animals, love plants, love each thing," he says. "If you love each thing, you will perceive the mystery of God in things. Once you have perceived it, you will begin tirelessly to perceive more and more of it every day. And you will come at last to love the whole world with an entire, universal love." "Every day and whenever you can, repeat within yourself: "Lord, have mercy upon all who come before you today." For every hour and every moment thousands of people leave their life on this earth, and their souls come before the Lord -- and so many of them part this earth in isolation, unknown to anyone, in sadness and sorrow that no one will mourn for them, or even know whether they had lived or not. And so, perhaps from the other end of the earth, your prayer for his repose will rise up to the Lord, though you did not know him at all, nor he you. How moving it is for his soul, coming in fear before the Lord, to feel at that moment that someone is praying for him, too, that there is still a human being on earth who loves him." Radical as it appears to us in the habitual isolations of the twenty-first century, this is not as uncommon a disposition as we might suppose. Even today, the monks of Mount Athos -- and holy men and women throughout the world -- are intentional in living this mystery of our unity and of our mutual responsibility, keen on living into it. With wholehearted struggle, they bear one another's afflictions; they carry one another in prayer; they ask forgiveness for their personal sins, for those of their brothers, and -- puzzling as this may seem to us -- they ask God to forgive them and us for our sins as well. One of the continuing misconceptions about monastics past and present is that these people have rejected the world altogether, and that by withdrawing from it they are primarily concerned with their own spiritual well-being. That may be how their choice appears to us outside their enclaves. From the inside, however, one can witness something else. Imitating Christ, they are -- in daily and deliberate acts -- performing the greatest love of all, that of giving their lives for their friends. Granted, these men and women are apprehending their own salvation, but -- as their ascetic lives develop -- their labors and their most earnest prayers are for the salvation of the entire world, for all of creation, for each and every one of us; that is to say, their salvation and our salvation are in their hearts bound together. Virtually every monk of Mount Athos struggles to acquire this understanding, as do increasing numbers of Christians worldwide who have worked to recover what has been for the most part a lost -- one might even say a squandered -- tradition. These men and women act upon the knowledge that, as members of the Body of Christ, each of us is utterly responsible for every other member, and, as human persons, each is responsible for all. For all of their apparent separation from "the world" and its madding crowd, these monastics are more attentive to its troubles than many of us who remain distractedly within it. While many of us live in heart-numbing isolation even in the midst of a teeming city, certain of these ascetics, in distant enclaves or in solitary caves, live in deliberate communion with each other, and with all of humankind. Unlike the great majority of us, they are actively laboring toward our common recovery from our long illness. "And what is a merciful heart? It is the heart's burning for the sake of the entire creation, for men, for birds, for animals, for demons, and for every created thing; and by the recollection and sight of them the eyes of a merciful man pour forth abundant tears. From the strong and vehement mercy that grips his heart and from his great compassion, his heart is humbled and he cannot bear to hear of or to see any injury or the slight suffering of anything in creation. For this reason he offers up tearful prayer continually even for irrational beasts, for the enemies of truth, for those who harm him, that they be protected and receive mercy. And in like manner he even prays for the lowest as a result of the great compassion which -- after the likeness of God -- is poured out beyond measure within his heart." The consensus of scriptural witness and of the broader tradition agrees that by the fact of our humanity, we are all of us already dwelling in "the image of God"; the trick lies in our proceeding into His likeness, wedding our hearts to His all-compassionate heart.